The art of sleeping has made leaps and bounds from a slump on the bed into a definite science. There is a certain approach to it that could either spell the difference between a good night’s rest and a painful body the next morning. And if you’re one of those who like to sleep on their sides, you’ve probably dealt with shoulder pain in the past. Luckily, there’s a proper tool for the job; and it’s certainly not the sharpest one. When you spend several hours on your side, you’re placing pressure on your rotator cuffs. Those are groups of tendons located in your shoulder that bind your bones and muscles together. And when you sleep on your side, you place a lot of pressure on them instead of your spine, which contributes to that iconic ache you feel when you move your arm about. That’s why the first thing you need in a pillow is support. You want something that provides a comfortable resting area for your neck and shoulders while you sleep on your side so that you lessen the pressure you place on your shoulders during all those hours of sleep. And there are several types of pillows that can do that. You’ve got memory foam, feather-filled, latex and buckwheat pillows. Here are some you might want to consider. 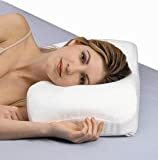 Cool Sleep Ventilated Gel Memory Foam Gusseted Pillow – This memory foam pillow does not return to its regular form after remembering the contour of your sleeping position. That means it will stay that way until the next time you sleep on it. Think of it as a soft mould for your shoulders. The memory foam used in this pillow also channels body heat away from your head and neck, keeping things cool for the best sleep possible. It has small opening in it that go from one side to the other, allowing the air the pass through the pillow. That means your breath doesn’t bounce back from the pillow’s surface as you sleep. And because it’s gusseted, it’s shaped to accommodate the contour of your neck going down to your shoulders compared to stuffed flat pillows. This makes it ideal for the side sleeper. The only drawback to this pillow is that it only has one gusseted side. You have a flatter end on the other side which you might find useless because you’d rather be sleeping on your sides instead of adjusting to your pillow. 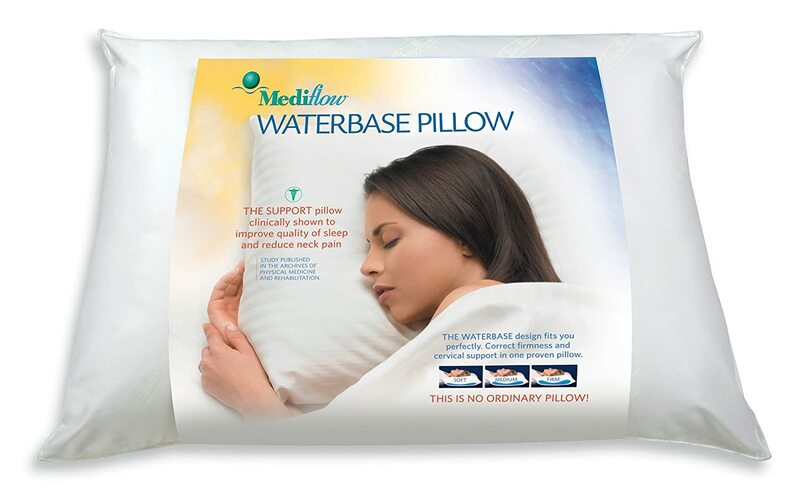 Mediflow Original Waterbase Pillow – This pillow works on a different premise compared to memory foam. This one uses water. But it’s not necessarily a water pillow like the ones you get from a waterbed. This pillow contains a fiber filling that’s hypo-allergenic. That means it doesn’t cause skin allergies and irritations. This mesh of fiber is then supported by a water bag that you can fill. This is where the product begins to shine. Because you can dictate the amount of water you place in the bag, you can also dictate how firm your pillow is before you sleep. Do you want something softer for your light frame? Try adding less water. If you’ve got broad shoulders that need a taller and firmer pillow, then add more. It’s literally a pillow that you can control. You won’t need to switch pillows or use several of them to find the perfect pillow sweet spot. The only drawback to this product, though, is that it was made for the general sleeping public. You’ll notice that the pillow isn’t gusseted which means you’ll most probably be filling it up to the maximum to get a pillow height to match your shoulder length. It also isn’t memory foam. So this means your neck will still be subject to pressure before your body can completely ease in to the pillow. 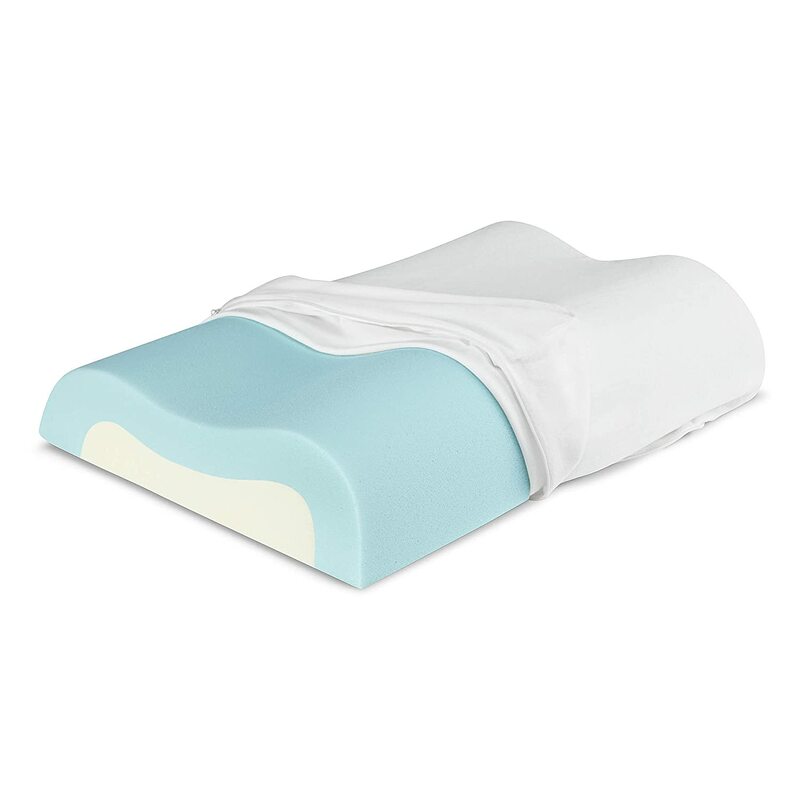 Sleep Innovations Cool Contour Memory Foam Pillow – This is another memory foam pillow but without the cool gel foam. This one is made with a different material and is shaped to better fit the curvature of your neck. It’s been known to reduce pain in those areas and bring about a more comfortable sleeping session. The first thing you’ll notice about this pillow is the shape. It doesn’t look like a regular pillow which gives it a more “therapeutic look”. And the look is legitimate. That design was specifically made to entertain your neck and distribute pressure evenly, making it feel quite natural to sleep on your side. The one thing you might not like about this pillow is the smell. On your first night with the pillow, you’ll immediately notice a chemical smell that might make it uncomfortable. This is normal according the pillow manufacturers. It usually disappears after several nights of usage. 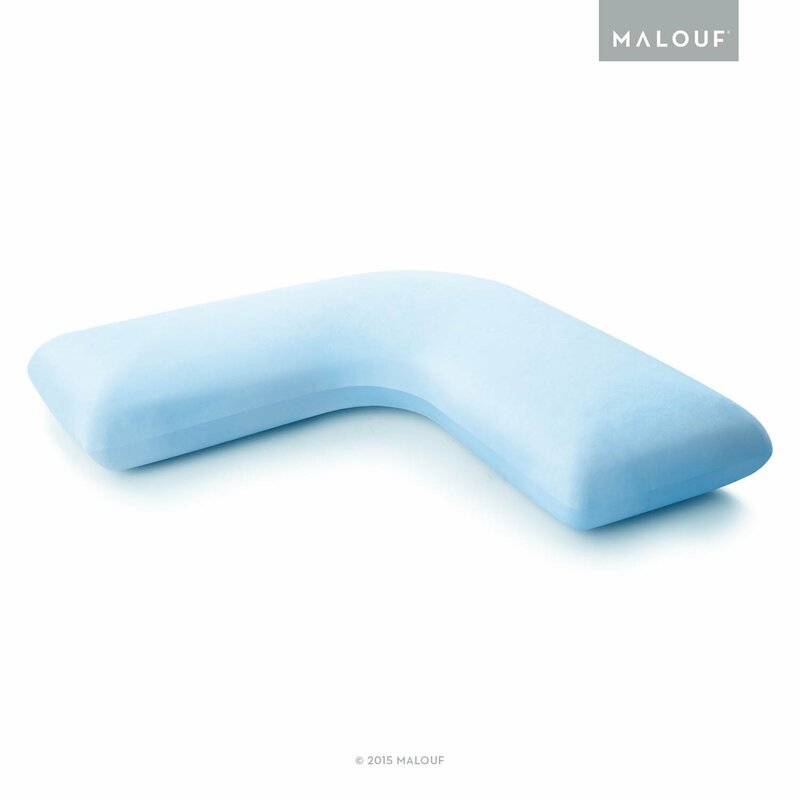 Boomerang L-Shaped Gel Memory Foam Pillow – Manufactured by Malouf, this interestingly-designed pillow sports a unique shape that is catered for the dedicated side sleeper. As its name suggests, it’s L-shaped. It’s specifically made for the side sleeper. You lay it down on your bed like an inverted L with your nose at the apex of the angle. This shape has been said to work best with people who sleep on their sides who don’t move around a lot. And because of its shape, you won’t need two pillows for your head and stomach, one pillow takes care of all of that for you. And because it uses memory foam as well, it will make sure your next sleep is a match made in heaven. If you’ve been used to standard and gusseted pillows for the longest time, you might need some getting used to with this pillow. You could find yourself grabbing for that second pillow in the middle of your sleep, only to find that you don’t need it anymore. SleepRight Side Sleeping Memory Foam Pillow- Although this one is considered as another memory foam pillow, you’ll be surprised to know that this one comes in a well-constructed design that makes it applicable only for people who sleep on their sides. The center of the pillow hosts a full facial cradle that keeps your head in place as you sleep. It’s a snug fit that won’t feel restricting in the least. This is accentuated by a 12 degree shoulder cradle that keeps your neck and back aligned to put less pressure on the spine. It doesn’t restrict blood flow to in between your neck and your shoulders so you won’t feel them go numb when you wake up. Besides those cradles, the pillow also supports air paths on both sides to help prevent snoring as you slumber. If there ever was a pillow that was only meant for a side sleeper, this is it. People who sleep on their backs or their stomachs would have a hard time using this pillow. But despite that, you might have some trouble getting used to this one because of the very cradle itself. If you move a lot in your sleep and change positions every now and then, you might not be able to take advantage of the pillow’s features and end up in awkward positions when you wake up. Support is King – The whole concept of a good night’s sleep is being comfortable. If a pillow is not comfortable in the least bit as soon as you lie down on it, it’s not good for you. Remember, your pillow has to adjust to you and not the other way around. Your ideal pillow has to support your neck down to your shoulders. If it doesn’t do that, then you’re wasting your time. Smaller Sizes Go a Long Way – If you’re on a budget but you really like a certain pillow, try to see if there are smaller versions of it. This will save you money and get you exactly what you want at the same time. And although some of the best pillows could cost around $130 upwards, you can get something really good for just $40. Just track back to what your read earlier. Be Generally Specific – You want something specialized for your brand of sleeping. If possible, as sales staff about how a certain pillow works with side sleepers of if a particular pillow is side-sleeper-only. Ask if it’s a Chiropractor Pillow – That would verify if the product you’re looking at was designed by a specialist in the joints on your spinal column. If it is, then you’ve got something good in your hands. Although you want something comfortable when you sleep, you also need something that’s good for your body to make sure you’re not worried about anything when you wake up. And a good chiropractor pillow is designed with both your comfort and your posture in mind. Not only will you be sleeping right; you’ll also be sleeping well with the right choice.